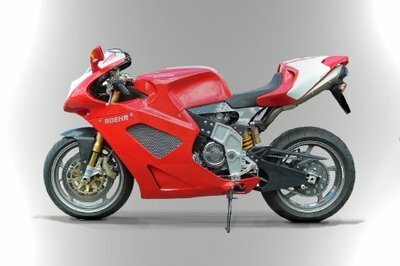 The Ducati Desmosedici GP11 VR2 was auctioned by Ducati with an estimated price of €300.000-€350.000. 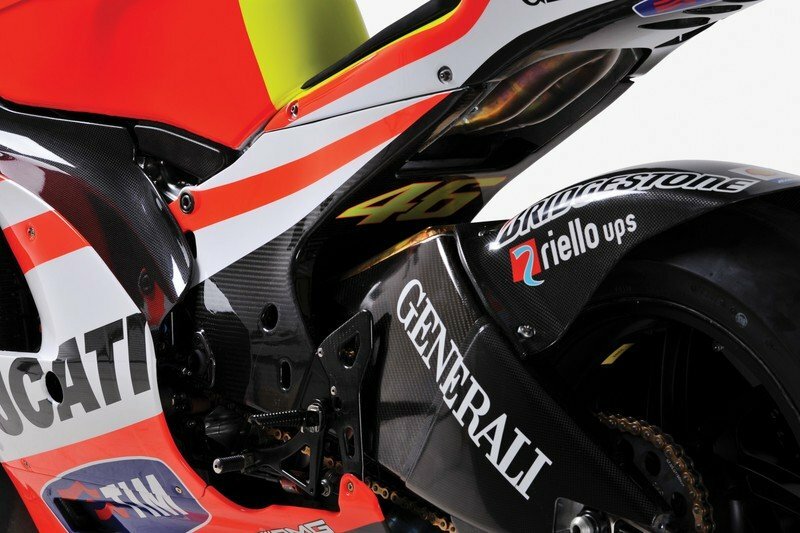 The motorcycle was the second of four variations Rossi raced during the 2011 season but is ostensibly the same as the GP10 of the previous season. 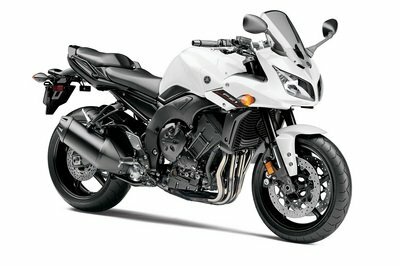 The motorcycle is fitted with a 800-cc D-16 engine and the suspension was an Öhlins TRSP25 48-mm “Through Rod” front fork with a TRSP44 rear shock absorber. The bike had also received a new carbon airbox and a new electronics package designed to soften the savage throttle response lower down. A more sophisticated traction control system was also introduced, and engine revisions included a higher inertia and crankshaft to further tame the throttle response. As MotoGP moves into a new era in 2012, Rossi’s GP11 exemplifies the evolution of the 800-cc D16 from the world-beating GP7 through until the end of this formula in 2011. 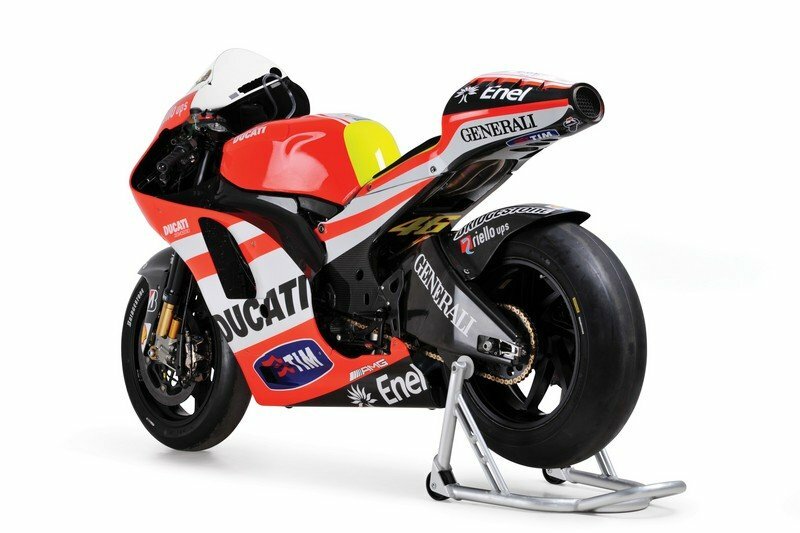 The GP11 was the ultimate development of the D16 that provided Ducati their only MotoGP World Championship. Hit the jump for more information. The big news for Ducati for 2011 was the signing of megastar nine-time World Champion Valentino Rossi in a two-year agreement to ride for the MotoGP Ducati Marlboro Team. Rossi’s record made him arguably the greatest motorcycle rider of all time, with nine World Championships (seven in MotoGP) and 105 race victories (79 in MotoGP). He had previously won MotoGP World Championships on Honda and Yamaha, and the arrival of Valentino Rossi was meant to create an Italian dream team. Rossi also brought his crew chief from Honda and Yamaha, Jeremy Burgess, along with a tightly knit team of largely Australian and New Zealand mechanics. While the prognosis looked promising, unfortunately, the 2011 season was another disappointing one for Ducati and did not turn out as expected. 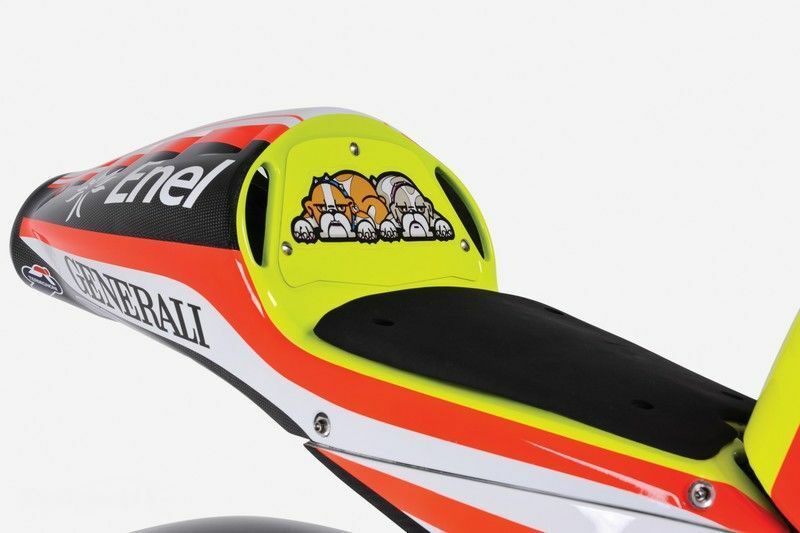 The machine presented here is the second of four variations Rossi raced during the 2011 season but is ostensibly the same as the GP10 of the previous season. 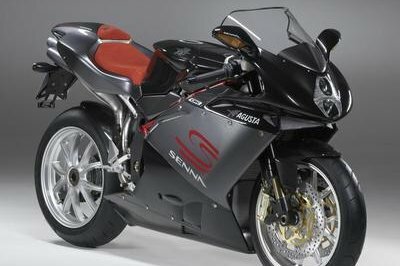 2011 was to be the final year for 800s, with a 1,000-cc V-4 planned for 2012. 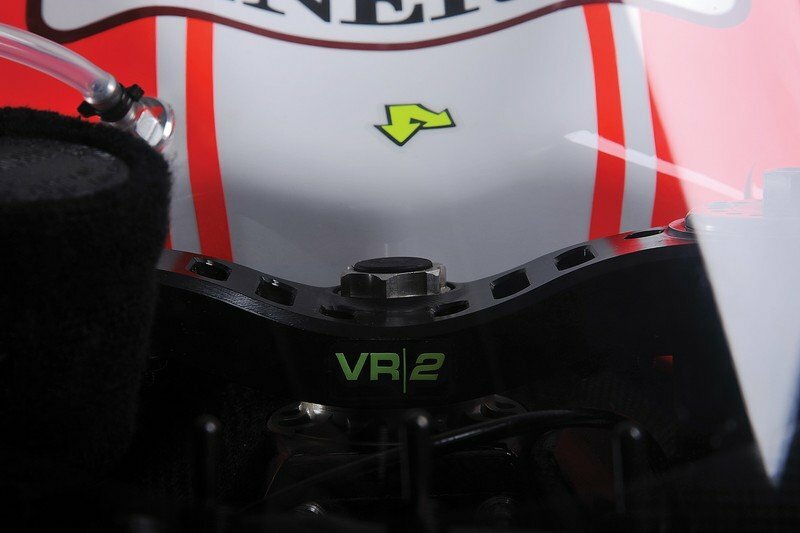 By the time Rossi joined the team, development of the GP12 was already well underway, and this development took priority over updating the GP11. The GP11 engine continued with the “big-bang” layout rather than the “screamer,” and the suspension remained an Öhlins TRSP25 48-mm “Through Rod” front fork with a TRSP44 rear shock absorber. Although Rossi had spent some time testing the GP11 in Malaysia and Jerez in February, he was still struggling with a shoulder injury and had some difficulty initially matching the pace of the opposition. Handling problems soon became apparent, and for the third race of the season (Estoril) a new carbon airbox, with different rigidity, was implemented. This was accompanied by a new electronics package designed to soften the savage throttle response lower down. A more sophisticated traction control system was also introduced, and engine revisions included a higher inertia and crankshaft to further tame the throttle response. For the fourth round at Le Mans, Rossi received an updated chassis (Step Two) with more flex built into the small carbon-fibre front airbox. 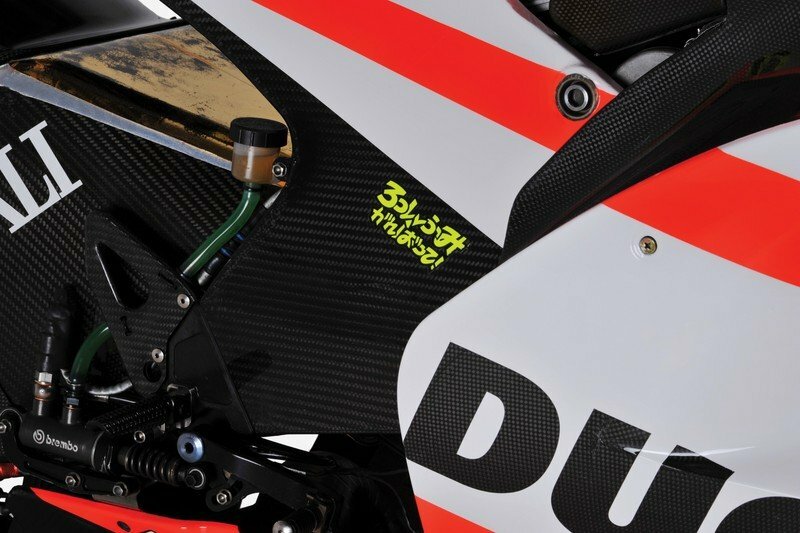 Rossi’s teammate Nicky Hayden had been asking for more flex ever since he first tested the carbon monocoque in 2010, and this update brought a marked improvement. The heavier crankshaft tested after Estoril had met with approval but was temporarily shelved, but the Step Two chassis proved easier to ride. Rossi managed his only podium of the season, finishing third on the machine offered here. But despite this improved result, the Step Two GP11 was only an interim solution. 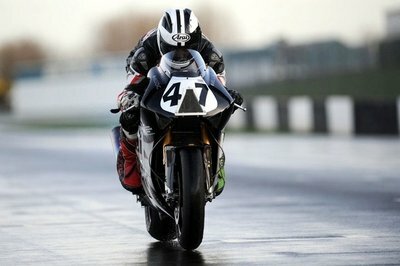 A race in the wet at Silverstone saw the GP11 replaced by a new amalgam machine. While Nicky Hayden continued to race the GP11 (Step Two), Rossi debuted an updated GP11.1 at Assen at the end of June. This third version was basically an 800-cc engine in the new GP12 carbon-fibre chassis, this requiring an updated engine with different mounts, as the rear suspension attached differently. As the engine was ostensibly that of the next generation 1,000-cc GP12, a short-stroke crankshaft and matching long con-rods were made so as to downsize the engine to 800 cc. The maximum bore for 2012 is 81 mm, so the stroke was reduced from around 48.4 mm to 38.7 mm. The new bike had the same carbon-fibre stressed airbox frame at the front as the GP11 but with an updated, inverted, swing-arm and rear suspension linkage similar to the Yamaha that Rossi was more familiar with. This successfully overcame the pumping action from the rear but was still not totally satisfactory. Also incorporated with the GP11.1 engine was a new gearbox with DST (Ducati Seamless Transmission). As the GP11.1 failed to deliver the expected results, a new aluminium frame was built in eight weeks and tested by Rossi at Mugello early in September in the 1,000-cc GP12. This chassis made an appearance in Rossi’s 800-cc GP11.1 at Aragón a few weeks later. The carbon-fibre rear subframe mounts to the rear of the rear cylinder head were unchanged, and the swing-arm pivot remained underneath the engine cases. The front frame mounts were resurrected from the earlier tubular steel frame. This frame seemed to be an interim design, with the aluminium beams still built around the carbon-fibre airbox. By late September Rossi was testing a 1,000 with a more conventional full-beam aluminium frame similar to the Yamaha Deltabox that had provided Rossi so much success in previous seasons. As the new aluminium frame required yet another revised engine mount arrangement, Rossi exceeded his six-engine allocation and was penalised with a pit-lane start, ten seconds after the lights at Aragón. But the improvement became obvious when he qualified seventh at the next race at Motegi, only to become involved in a pile-up at the second corner. Rossi’s 2011 season was summed up in the final race at Valencia when he was again taken down, this time on the first corner. 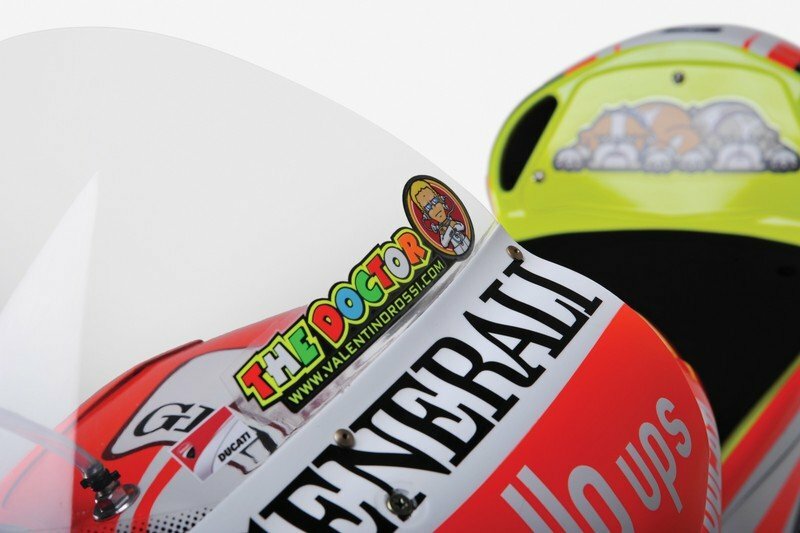 In the history of Ducati’s MotoGP efforts, Rossi’s GP11 is historically extremely important, and its offering directly from the factory marks a tremendous—likely unrepeatable—opportunity for collectors. This motorcycle will be supplied with a certificate of authenticity from Ducati Corse (racing department), and the fortunate new owner will be given a VIP tour of the Ducati factory in Bologna. Please note that to purchase lot 202 the Purchaser must sign an Agreement with Ducati Motor Holding S.p.A. in which the Purchaser accepts and agrees to abide by specific terms and conditions of ownership. A copy of this Agreement can be obtained by emailing a request to legal@rmauctions.com, and RM representatives will have copies of the Agreement available for distribution at the Monaco Auction. Also, Ducati Motor Holding S.p.A. has provided a summary of the Agreement, which is printed in the conditions of business in this catalogue on page 170. Purchasers must satisfy themselves as to the requirements as outlined in the Agreement. RM accepts no responsibility as to the contents or operation of the Agreement. Please note this lot is subject to VAT (at 21%) on the full purchase price (both on the hammer price and the commission).